Green Daun is a craft shop in Damansara Perdana, Petaling Jaya which started business in July 2016. 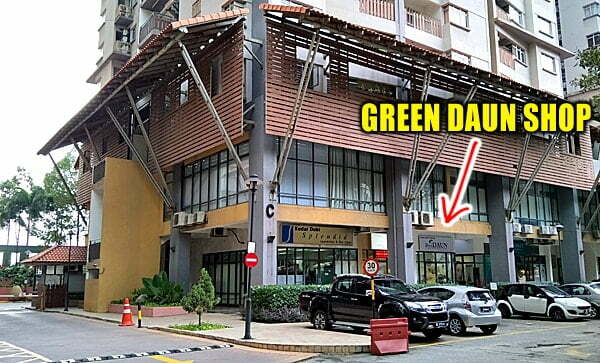 For those who want to know more about Green Daun, the brand name Green Daun signifies a very local Malaysian theme where Green is a neutral earth color and Daun is Leaf in Bahasa Malaysia. Our craft shop in PJ sells dream catchers, dream catcher accessories and materials, beads, macrame materials, satin ribbons, basic stationary, custom made jewelry, jewelry accessories, findings, filigree, charms, steampunk accessories and many other interesting items. The Green Daun craft shop was opened on 20th July 2016, and is a small cozy craft concept store which is very personalized and also modern contemporary designed. If you have been to some of the older craft shops in Malaysia, we do not follow that kind of style, as nowadays, retail experiences are very important to customers. Some customers have even called us a Hipster craft shop or even a boutique craft shop because of our cozy concept, and the kind of craft items we sell. Dream Catchers – Ready made and custom made dream catchers of all shapes and sizes. Feathers – Over 20 different types of bird feathers in many colors and sizes. Peacock Feathers – Original three feet peacock feathers and even specially colored ones. Eagle Feathers – Unique eagle feathers for decorative or even spiritual use. Rings and Hoops – Metal, wood, plastic, acrylic and wreath rings in many sizes. Yarn and Thread – For dream catcher and other carat making. Not for sewing. Cords and Tassels – We sell a number of cords including nylon, faux suede, metallic cords and also tassels. Beads – Many different types available including glass, wood, plastic, ceramic and crystal beads in many sizes. Lava Beads – Original black lava beads in many sizes and shapes are available. Remember, the colored lava beads you see in the market are not real. .
Semi Precious Beads – We sell individual semi precious crystal beads like Tiger Eye, Malachite, Aquamarine, Agate, Tourmaline, Citrine, Amethyst, Clear Quartz and over 50 others. Rudraksha Beads – For making mala and bracelets, we also sell 1 Mukhi, 4 Mukhi, 6 Mukhi, 7 Mukhi and many other Rudraksha beads. Borneo Beads – For making traditional ethnic Borneo jewelry. Amber Beads – We sell Baltic Amber beads in various types like Cherry Amber, Honey Amber and so on in our shop. Kayu Raja Beads – Available in a number of sizes, but we sell them as bracelets, necklaces or Mala. Beading Accessories – Spacers, eye pins, lobster claws, hooks, elastic cords and many others. Beading String – A number of types of beading strings and cords. Crystal bead bracelets and necklaces – Ready made and custom made crystal bead jewelry available. 7 Chakra Bracelets – Custom made or ready made chakra bracelets with real crystals are also available. Jewelry Repair – We do basic jewelry repairs, for bracelets and necklaces. Sorry, we do not repair gold, silver and Pandora jewelry. Macrame Materials – There are many different types of macrame cotton cords available, including the wooden rings for macrame making. Mala – We custom make Mala for meditation or prayers, including Tasbih. We also sting it for those who need Mala repair or re-stringing. Steampunk Accessories – Loose parts available for Steampunk jewelry making or adding them to your props. Charms – Over 200 different types of charms in gold, silver, bronze, antique gold and patina available in many sizes, and sold individually. Seed Beads – We have some seed beads available for those into beading, brick stitch and peyote jewelry. Ethnic and Native Jewelry – There are some unique bracelets and headbands made from various ethnic tribes of Malaysia, Borneo and Papua available in our shop. If you are unsure about anything, it is best to contact us to see if we have the item for sale. Unless you live in the area, you can just drop by and see the many items we sell in our shop. For anyone who lives out of Kuala Lumpur or Petaling Jaya, you can always Whatsapp or call us first before dropping by. Our mission is simple and straightforward, where we aim to provide a friendly and modern day craft business that suits today’s lifestyle trends. We sell materials that are in small quantities, which are suitable for hobby crafters or even hobby jewellery makers. We speak multiple languages like English, Malay and Chinese therefore communication is no issue at our premises. Our prices are very affordable while we take serious pride in our craft business, therefore you can expect quality over quantity. Our materials and products are sourced from quality manufacturers and suppliers from around the country and region, hence we can keep our cost low, compared to high-end imported craft materials. Craft should always be fun, and we do our ultimate best to make it fun for everyone, and also in an affordable way. One of our specialties include Dream Catcher Making Classes in Malaysia as this has been a popular trend in the last few years. To date, we have conducted over 200 classes for this craft with age ranging from as young as seven years old till 75 years old. They say, you are never to young or old to learn craft. As Green Daun is also a retail craft shop, we sell many other things here, mostly for hobby crafters and small businesses. One of our fast moving products are feathers, and if you have been wondering where to buy feathers in Malaysia, we probably sell the largest selection in the country. Sat, Sun & Public Holiday: 11.00 AM till 5.00 PM. Best to call first as sometimes we may close for a short while just before lunch, or to run to the post office for quick delivery. You can also check out Green Daun Facebook Page for any updates on when we may close. 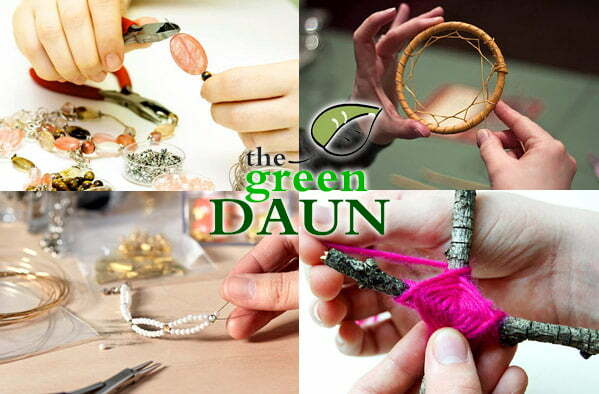 Do drop by our craft and jewellery shop in PJ and if you have any questions about Green Daun, and we would be glad to assist you to our very best, even if it is to recommend other craft shops or even craft classes. After all, the more we share, the more we learn and we are the new generation where we do not practice the ‘competitor’ mentality. See you at the Green Daun Craft Shop.